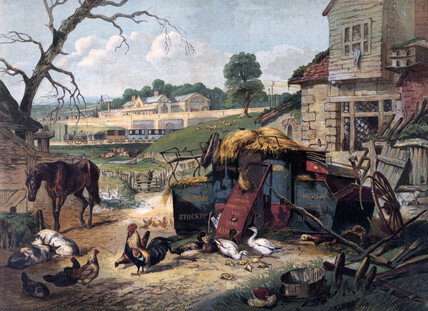 Colour print showing a derelict coach in a farmyard with a steam railway in the background, to illustrate the demise of travel by coach in favour of the railways. The abandoned and dilapidated coach is topped with a pile of straw and surrounded by hens, a cockerel, pigs, ducks, ducklings and a horse. Beyond the farmyard are more farmyard animals including cows and a cowherd, who is watching a pasing steam train. In the distance is a pristine newly built station. Printed by Leighton Bros.